You must be a member of the New York French Culture Group to attend this activity. Would you like to join this group? Although the following description is in English! HOT NEWS - To Understand what's going on in France these days. 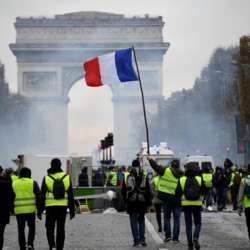 who will discuss how the imaginary of the French Revolution reappears in contemporary social movements such as the Protected content against the state of emergency and the labor law and Nuit Debout, and the Yellow Vest movement in Protected content . She will speak about these movements in the present and against the backdrop of the history of the French Revolution. Ask to the University security where it is if you can't locate it on the campus map or in following the below direction. La Maison Francaise is located on the right of the Alta Mater Statue which is in the middle of the stairs in the Main Campus; quite difficult to miss. When you have the Alta Mater Statue in front of you, La Maison Francaise is on the right in the top of the stairs. Plan to arrive Protected content before the beginning.